A hammer with a rounded head, used for peening pins and for restoring proper tension on Loose scales. (also hollow point, hollow notch) A rounded cut-out at the toe of a straight razor. No definitive reason for the design has been uncovered. (also thrust bearings, thrust washers) A pair of thin brass disks used as bushings. Placed between the scales and the blade, one each on either side of the tang. The sloping faces leading to a razors edge which make contact with the stone during honing. 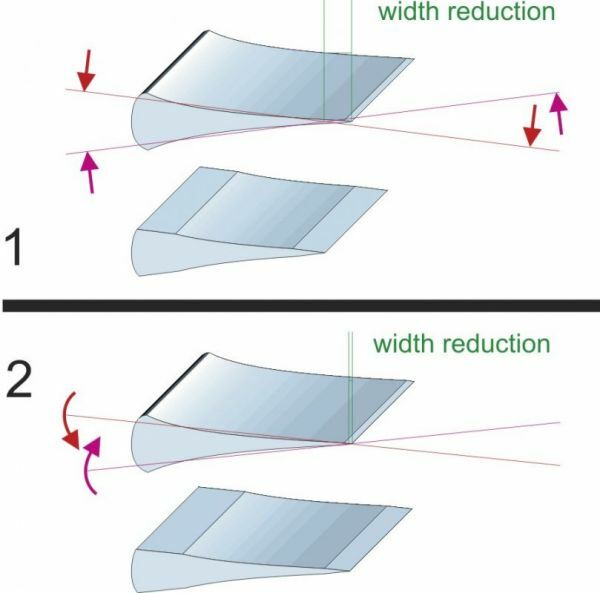 Width of a bevel is determined by the blade angle formed between the thickness of the spine and overall width of the blade. The size of a bevel can range from barely visible on a extra hollow razor to the full width of the blade on a true wedge. Unevenness in the grind of the spine, or spine warp, can form an uneven bevel, as can an excess of localized pressure during honing. (also frowning edge) When the edge of the razor is concaved towards the spine of the razor, making it appear like a frown. Opposite of a smile. Frowns should be removed before honing the razor. A razor grind in which the steel thickness of the blade is minimized. Viewed from the end this appears less wedge-like and more like a thin slice of steel. Creates a flexible blade with a thin bevel. Used to assess the keeness of a razor's edge during honing. It tests the razor's ability to cut a single hair at a given distance when held between the thumb and index finger. See the Hanging Hair Test article in the Sharpening Academy. Also see the Edge Probing and Assessment article for more information regarding razor tests. The portion of the edge furthest from the toe. A triangular taper, cut at the lower part of each side of the tang near the heel of the blade. The cut narrows the tang in that area to avoid hitting the edge of the hone at the start of a stroke. The serrations sometimes found on the bottom and/or the top of the tang. They provide a better grip on a razor. A condition in which scales have lost their tight grip on the tang of the razor. Can usually be fixed with a ball peen hammer. In cases where the razor is assembled with screws instead of the more traditional pins, simple adjustment of the screw fixes the problem. Tapping the end of a pin with a ball peen hammer, in order to expand it. As a result, the now mushroom shaped pin no longer slides trough the hole in the washer. This secures a tight fit and puts the connection under the required tension. Pins are traditionally made of Brass, Nickel Silver, Steel, or Stainless steel. Washers are placed over the ends of the pin before they are peened. The grind of a razor refers to the hollowness, or concavity of it's sides. The grind can range from full hollow to a complete wedge, with grinds inbetween measured as fractions of a full hollow (e.g. 1/2 (half hollow), 1/4 (quarter) hollow, etc.). (also smiling edge) When the edge of a razor has a curve that bulges away from the spine. The opposite of a frown. Requires special approaches for honing, see "rolling X-stroke". A band of leather and/or fabric used to maintain a razors cutting edge. Can be free hanging or attached to a paddle. See stropping a straight razor. Part of the razor between the pivot and the shoulder of a straight razor. Used to hold the razor with a pinch grip, while shaving. Usually stamped with makers marks. Location of jimps. The force between the tang and the scales. Proper tension prevents the blade from pivoting too loosely. (also lock washers) The flat or raised metal disks placed on either side of a pin on the outside of the scales. Provides protection against the scale being damaged while peening and can help seat the peened head of the pin. The most fundamental of all honing strokes. Starting on the heal and (during the stroke) gradually moving the razor horizontally until the toe comes into contact with the hone; the back and forth strokes form an 'X' pattern. X-strokes should be used regardless of whether or not the hone is wide enough to accommodate the entire length of the razor. This ensures that the whole length of the edge comes into contact with the hone. See honing strokes.